Have you seen our report, ON: Europe? No?! Why not? We polled people across the UK, France, Germany, Italy and Spain to work out Europe’s media consumption habits. Here’s a snapshot of the results but to request the full report, email hello@on-broadcast.com. Households across Britain and Spain are the most likely to get their first exposure to news before they leave the house, whether that’s via broadcast, print or online media (49% UK v 45% across Europe). And it’s breakfast television that’s most likely to be turned on. One in four (23%) British adults tune into TV news before they go to work compared to one in six (16%) across Europe. In fact, Britons are more than twice as likely as Germans (10%) to switch the TV on for a news update in the morning. What is Europe’s primary news source? Broadcast channels reign – especially in the UK. Over half (52%) of adults in the UK turn to the TV as their primary news source – the highest rating in Europe, where on average two-fifths (40%) tune in as their main source of information on news and current affairs. Radio and TV are Britons’ most trusted media platforms. Italians are the most likely to log on to online news media (20%) as their primary news source – but Britons aren’t far behind (18%). Dwindling print media engagement comes despite the fact that the French are four times more likely (23%) than British adults (6%) to pick up a broadsheet as their main news source. In fact, when it comes to primary news outlets, the UK currently has one of the lowest engagement rates with print media in Europe with just one in ten choosing a tabloid or broadsheet as their main access to news. Perhaps it’s the ‘Leveson effect’, but over one in three (38%) UK adults believe the media should be monitored more, compared to just under one in five (18%) on average across Europe. Britons are least likely to think the media should be self-regulated (12%). And we’re most likely (38%) to be critical of a close connection between media and government – compared to our German, French, Spanish and Italian neighbours (35%). British antipathy towards the media / government relationship is even greater than Italy’s (34%), where media tycoon and Prime Minister Berlusconi’s recent downfall raised questions about close ties between the press and those in power. The integrity of the tabloid press is damned throughout Europe, with 56% saying they distrust tabloids. Perhaps not surprisingly for a nation that has become cynical, Brits aren’t just channel-hoppers, they’re ‘media-hoppers’ – the UK is most likely to check a number of different news sources throughout the day. 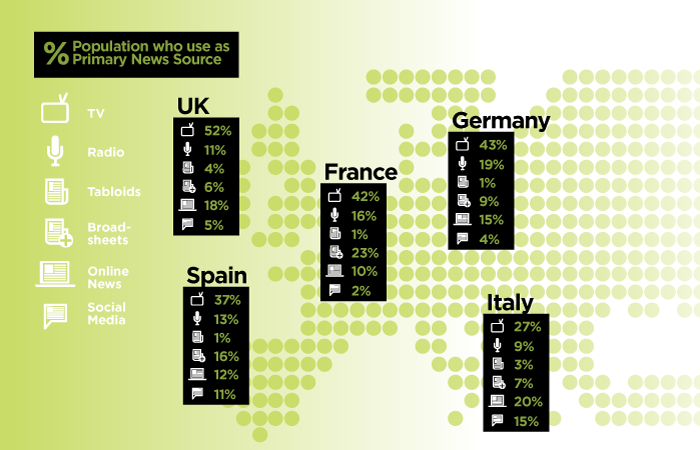 Italian, German, Spanish, French and UK adults ranked each media channel according to how much they think they will use it as a source of news in 2019 compared to now. Online is currently one of the most popular sources of news, with 18% of Britons and 15% of Europeans naming it their primary channel for current affairs. And those usage figures are set to sky rocket by 2019, with adults across Europe saying they’ll increase their use of online news sources more than any other media channel. Over the next five years, TV and radio news will become even louder across the UK, France, Italy, Germany and Spain as broadcast news consumption is set to rise 23 index points, second only to online media at 32 points. Meanwhile, public opinion indicates that tabloid sales will continue their general fall as it fared worse at -50 index points. An online survey was conducted by Vision Critical among 4,034 randomly selected adults age 18+ who are also Springboard network members living in the UK, France, Germany, Italy and Spain. The 4,034 respondents were broken down as being from: France (500), Germany (505), Italy (500), Spain (502) and the UK (2027). Discrepancies in or between totals are due to rounding.